Many people love the summer—and for good reason! Kids are out of school (teachers, too! ), families are going on vacation, and there are so many outdoor events to attend. It’s true: summer is a fun season. But with it comes extreme heat, which can cause symptoms of heat stroke. Not to worry, though, because we’ve laid out for you the symptoms of heat-related illnesses—heat cramps, heat exhaustion, and heat stroke—as well as what to do if you or someone else is experiencing these symptoms. Heat cramps are mild in relation to other heat-related illnesses, but they can lead to more severe problems if left untreated. Symptoms typically occur during or after strenuous exercise in high heat and involve painful muscle cramps and spasms, as well as flushed, clammy skin. If you experience these symptoms, move to a cool place to rest. Take off any excess clothing and place cool cloths on your skin. Fan your skin. Drink a cold sports drink—like Gatorade—that contains salt and sugar. Finally, be sure to gently stretch the cramped muscles. When heat cramps are left untreated, or conditions are extreme enough, heat exhaustion can set in, occurring when you experience extreme heat and sweat profusely without replacing fluids sufficiently. The symptoms of heat exhaustion are muscle cramps, clammy skin, nausea, vomiting, headache, fatigue, weakness, diarrhea, pale skin, and anxiety. Heat exhaustion usually causes a fever over 100.4° F.
To treat the symptoms of heat exhaustion, rest in a cool place and remove excess clothing, fanning your skin to cool it. Use cool cloths on your skin. 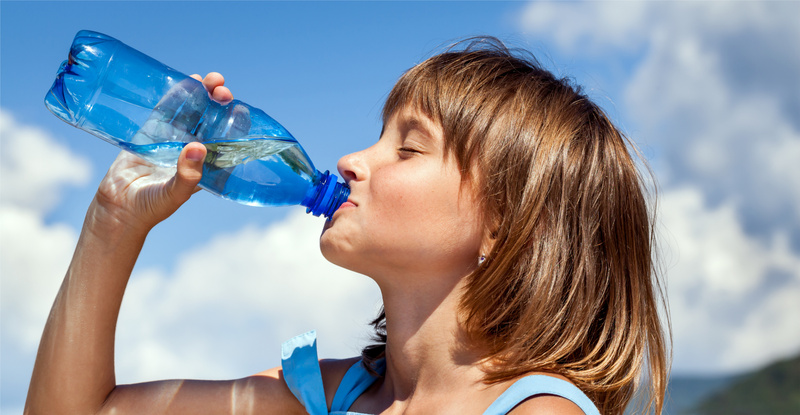 Drink a sports drink containing salt and sugar to replace lost electrolytes. If there is no improvement or fluids can’t be taken, call your primary care physician or go to an emergency department immediately. The most dangerous heat-related illness is heat stroke, which occurs when your body becomes overwhelmed by extreme heat. This is a life-threatening emergency requiring immediate medical attention. Symptoms include warm and dry skin, rapid heart rate, loss of appetite, nausea, vomiting, headache, fatigue, high fever (usually over 104° F), confusion, agitation, lethargy, stupor, seizures, and coma. Heat strokes can also cause death. To treat these symptoms, move to a cool place to rest. Call 911 immediately. Remove excess clothing and drench your skin with cool water, then fan your skin to cool it more. Place ice on your armpits and groin. If you’re able, drink cool fluids. Heat stroke and other heat-related illnesses can be dangerous, but if you take the right precautions and follow these instructions in the event that you experience these symptoms, you can stay safe in the heat of summer.